The first poem ‘mixquic’ is addressed to ‘sean’, whom the book is also, in part, dedicated to: ‘for sean, again / for mum and dad’. The ‘you’ in the poems, it might be assumed, is Sean. you see. leashes slack on the ground. and for how long? would they break their feet? He argued that if wings were not the essential elements in determining the difference between a hawk and an airplane, they were even less so in the recognition of angels. for it to taste a certain way or something. like going for a hamburger or barbacoa [barbeque] like big deal they just go. The rarity of end-stopped lines and the way in which Hunter positions the sentences across the page accentuates the free associative design of her syntax. When end-stopped lines are included (‘did they not fight enough / did they not love enough’) they are all the more forceful. 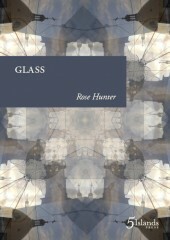 The fact that Hunter uses enjambment across numbered sections and their respective page breaks and the way she often begins poems with ‘and’ or ‘or’ contribute to the impression that even though there are 21 poems divided into three chapters (‘mexico city’, ‘jalisco’, and ‘brisbane’) Glass in many ways reads like one extended poem. The extent to which Glass is autobiographical is of course irrelevant, but the personal and somewhat regretful tone that pervades the collection make the poems nearly always compelling. This entry was posted in BOOK REVIEWS and tagged Kishore Ryan, Rose Hunter. Bookmark the permalink. Kishore Ryan recently interned at Cordite Poetry Review and is currently studying composition and literature at Monash University. He is the son of the poet Max Ryan, whom he plays in a band called Hexham with. He also plays drums with Mick Turner (Dirty Three) and Lisa Salvo (On Diamond). His composition ‘I Purchased Two Donkeys’ for percussion and electronics will be performed at the 2018 Bendigo International Festival of Exploratory Music by Line Upon Line (USA). His poems have been long-listed in Poetry Society’s National Poetry Competition and published in Malevolent Soap. He was also a semi-finalist in 92Y’s 2016 Discovery/Boston Review Poetry Contest.